Oh, they'll never forget it, alright. 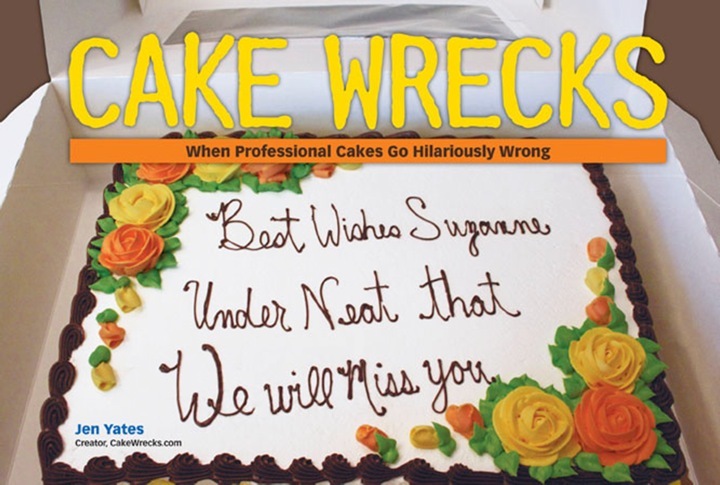 Thanks to wreckporter Robert W., who tells me this cake is currently sitting on a bakery counter - right next to that first picture - as a means of advertising. Or, as Robert suspects, perhaps more as a warning. P.S. The longer you look at this, the funnier it gets. Seriously. Can we take a moment to "appreciate" those bottom borders? And the fact that the baker used the giant shell tip to do all the delicate piping work? Huh? Can we? Maybe, just MAYBE, the bakers put this version of the cake out there because they knew that their patrons have a nasty habit of sticking fingers in the icing of freshly decorated cakes (as is evidenced by the lovely drag marks and squishes all along the bottom layer)? Y'know, so their patrons can enjoy how delicious the icing is, without sacrificing hours and hours worth of the bakers' work? I don't see the conflict. Disasters are always more memorable. The flowers look the same. Perhaps they have one or two cascades of artificial flowers to slap on the cakes and reuse at a later time. It's very "green." I've never quite understood the "make a real copy to put on the counter" concept. Then you have to put a "do not touch" sign by it or you get something similar to the bottom layer of the cake (I wonder if the messed up loop on the top tier suffered a similar problem). I'd make it in plaster (something that's soft like frosting, but sets up hard) personally. But then you have to put up a "do not eat-inedible" sign. I like the small "CCC" design in the bottom right-hand corner of the advertisement. There seems to be some confusion here. This isn't a cake -- it's the top of a Corinthian-style pillar found on the ruined Temple of Wreckopea -- the Goddess of Cake Decorating and Plaster Work -- in Athens. The degree of preservation is really stunning, with the only real damage visible on the right. You can tell it's from the Wreckopean period because of the width of the plaster swirls -- they didn't have the technology to make decorating/plastering tips with smaller openings until the Byzantine period. All modern wedding cakes owe their present design to Wreckopean architecture, although in recent years you see more influence from the Fondantian goddesses. This is kind of sad, actually. It looks to me like it could have been a nice cake, or at least a passable one, even if it wasn't an exact copy. Instead it sits on the counter, smushed and unloved. Poor little thing! I'm just happy that's not someones actual wedding cake. I'm always mildly depressed when we see ruined wedding cakes. If a bride ever got the second cake there would be a BRIDEZILLA meltdown that would be EPIC!!! All I can think of is, "fair warning"! If you see that marvelous example and still order the cake, then you're just askin' for trouble - and crummy cake! So, were all the #2 and #3 piping tubes in the dishwasher? You know... I've always noticed that the adults are the ones that poke cakes.... not the children. What??? You're telling me you've never seen a "braille" wedding cake? Sometimes I wonder if I should get into cake decorating. OBVIOUSLY I can do better than some of the bakers out there *shudder* Giant shell tip for delicate piping...smushed icing on the display cake...jammed in flowers haphazardly... sitting next to the lovely picture. It makes me cringe inside! @Sharyn loved your post! I am interested in the rest of the history of that time period. Well done, Sharyn, well done! Display cakes used to be done in royal icing on styrofoam. In the less humid parts of the country they could last years. I'm coming up to the end of my cake decorating course and a post like this always brightens my day. I can already do better than that second cake in my sleep. Not bad for a first try. I'd like to see any of you do better. Smiles that extend past the eyes. sulks. "Can wear shelltip again?" "So, were all the #2 and #3 piping tubes in the dishwasher?" No, no, all the tips were in use; there was just a little mix-up. Further down the bakery counter, you will find some very skinny churros. How long do you suppose they'll leave the cake sitting out? Will they rotate it periodically to expose new areas of frosting to curious fingers? After a few months, will the entire surface be rendered completely smooth by the hands of a thousand unwashed shoppers? Three possibilities: 1.) The first picture originated at a nearby competitor and was planted by agents for same. 2.) The cake was returned by a customer, who also took the second picture. 3.) The wreckerator is really into irony. It's a tough call. If that cake was the best I could do (it might be uncomfortably close), I wouldn't want it seen in the same city as the first picture. Of course, if that cake was the best I could do (and that is what I was being paid to do), I'd already have the other-line-of-work search underway. @Merry, the other tips were tossed for being too hard to clean. Suddenly in the mood for some buttercream icing. I blame the parent(s). They were one of those overly supportive, parents who LIE to you and tell you your dried noodle necklace looks JUST AS GOOD as those store bought ones. And the poor wreckerator believed it all this time. How else can you explain looking at the photo and then looking at the actual cake and saying, "Yup. That's so good, I'll display them together"? Brainwashing. That's how you explain it. Brainwashing. Well, at least they have someone skilled enough to do the flowers--can you request a specific baker? Or, maybe they just buy those...in which case, you could ask "where do you get these lovely flowers? ", and then order your cake from there! Wow the level of fail in this cake is [Red Alert Einstein}incredible[[Red Alert Einstein/] on so may levels. The 'buttercreme' is so poorly smoothed and looks so haphazard. The use of only one kind of decorating tip is insanely stupid. It just reeks of laziness. Give me 3 hours and I could do a better job and that isn't even trying. Was there a historical era when they were in vogue? May I also point out the vile CCC in the background of the add? As if we needed anymore proof that this is a horrible promise! Vile cake, YOU SHALL NOT PASS!!!!!!!!!!!!!!!!!!!! "I don't have the right frosting bag tip for this design, boss." "Well, there's no time to try to find another one. Don't worry. They'll never notice." Excellent point, @Andrea. This is what happens when everything which one has done since birth is a 'good job'. @Isolder74, Red Alert Einstein should be standing until further notice -- especially outside the CW universe. This always reminds me of when I had my wedding cake made. My mother found a local bakery that had apparently won awards for being the best bakery (nobody said the best at cakes...just baking, mind you...maybe they had the best cookies...) and walking in for the meeting I was horrified to see not a single picture of cakes they had done themselves. All were clipped out of magazines with the promise hanging in the air of "sure we can do it!". I was getting uneasy and was already debating how I would explain to my mother that obviously they couldn't do it when I spied a lonely display cake on a shelf all the way near the ceiling. It was actually rather nice, despite the whole thing being randomly piped curlicues (it actually made a cute lace-ish surface), and plastic roses draped in the icing. THAT WAS IT! I wasn't particularly picky or set in stone about my design. I asked them if the decorator that did that display still worked there and said, "I want that! Except with buttercream flowers instead of those plastic ones!" Naomi, you made me chortle outloud. Thank you. This isn't a cake at all, it is a rare female Dalek all dressed up for her coming out ball. And yet the flowers look gorgeous. Something tells me that the person who made the flowers is not the same person who decorated the cake..... just a hunch. This reminds me of a guy I used to work for, who thought that the HUGE shell tip was fine for, y'know, whatever. I guess bigger really is "better"? "Display cakes used to be done in royal icing on styrofoam. In the less humid parts of the country they could last years." That practice continues. The problem is that they often neglect to dust the displays, and the cakes end up looking like Miss Havisham's. Hey, at least the baker jammed the pre-made, likely came from a box, fake flowers quite elegantly into the icing. Well at least they got the flowers right....thats all any cares about anyway....right? They gumpaste flowers were probably bought ready-made (usually made in the Philippines), which is likely the only reason they look like the ones in the photo. There are a number of websites where you can mail order gumpaste flowers, though they tend to have thicker petals than those made by local experts, since they need to survive shipping. I love the point about using the same giant shell tip for the decorating. Couldn't even be bothered to switch tips or have two bags of frosting to decorate with to switch it up! This blog looks great. These cakes will really make a special occasion memorable. The flowers on the cake looks really , what a wonderful designer cake . Thanks for the post. There are wild beast claw marks in the side. Maybe they have rodent issues in this bakery! I don't understand how the baker could spend so much time on making the flowers (or more likely buying them) and then make a cake that pathetic. Did they have their 4 year-old decorate it? SOMETIMES when I'm at home making an everyday cake for my kids just so I can play with icing, just SOMETIMES, I don't want to search for the tip I know I should use and I willy nilly any tip to play with... THAT's what this looks like! !